What changes will make the 2018 Mazda 6 different? Nothing is likely because an all-new version of this midsize sedan is expected during calendar 2018 as a 2019 model. That upcoming fourth-generation Mazda 6 will have a new body and probably will get two new engines — including a long-awaited diesel four-cylinder. 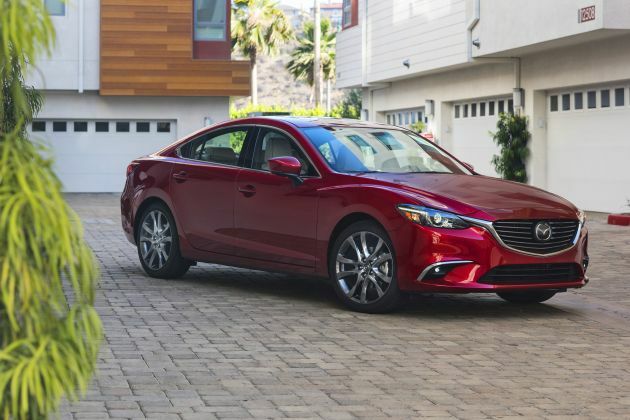 Meanwhile, the 2018 Mazda 6 will continue as arguably the comeliest ride in a segment known primarily for family-car values and serviceable styling, ala the Toyota Camry. Supported by outstanding road manners, those good looks help it compete with far more popular – and newer – rivals. 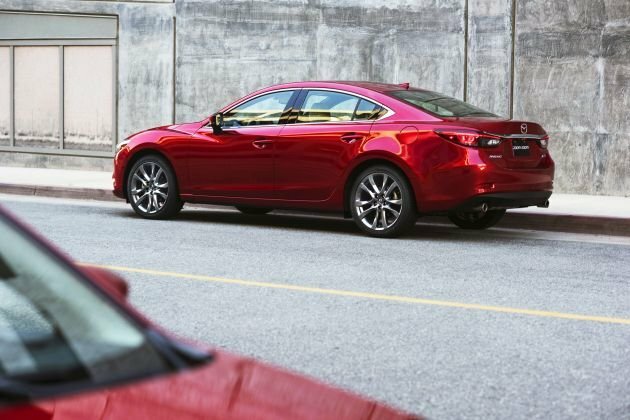 Indeed, the current-generation Mazda 6 launched for model-year 2014 and the hold-over ’18 edition will face redesigned versions of the Camry, Buick Regal, and Honda Accord. As a small, independent automaker, Mazda doesn’t have the resources of its competitors, so its engineers tend to make improvements to existing technology through measures like cutting weight and reducing mechanical friction. The company dubs this holistic approach to efficiency SKYACTIV, and it complements Mazda’s commitment to sharp handling and an enthusiast approach to the driver-car interface. The third-gen Mazda 6 was a hit with critics, less so with the public. Sales are near the bottom of the class – Camry outsells it nearly 10-1 — a situation particularly painful to Mazda as buyer preferences in general are shifting from midsize cars to crossovers and SUVs. You probably shouldn’t. With the redesigned model waiting in the wings, the ’18 will be a virtual rerun of the ’17, but it’s likely to cost more. And it’ll be that much closer to looking and feeling dated. The lineup should repeat the 2017 roster of a base Sport model, midlevel Touring, and top-end Grand Touring. All would return with front-wheel drive, and one four-cylinder engine linked to either a six-speed manual transmission or a six-speed automatic. To Mazda’s credit, it’s labored to keep the 6 fresh. The car got updated interior and exterior styling for 2016 and was further enhanced for 2017 with more sound deadening and a further boost to handling with addition of G-Vectoring Control. That’s the automaker’s innovative technology that automatically reduces engine torque slightly before you enter a turn. That subtly weights the car’s nose, enhancing grip and overall handling response. Yes, because you’ll be getting essentially the same car as the 2018, but you’ll avoid the almost inevitable price hike – however small it may be. And you’ll get to enjoy your 6 for a longer time before the redesigned ’19 model makes it feel dated. Happily, the 2017 version is the quietest, best-handling 6 ever. Sport and Touring models offer lots of features at competitive prices. At $31,570 to start, the Grand Touring can look a little out of its league against similarly priced rivals with a V-6 engine, including the Accord, Camry, and Nissan Altima. Speaking of pricing, Mazda tends to be relatively stingy with incentives. As of May 2017, the best offers on the 2017 Mazda 6 were no-interest financing for 5 years, plus $500 factory cash back; or a straight $2,000 rebate in lieu of the cut-rate financing. By comparison, a 2017 Altima was available with no-interest financing for 6 years, plus a $1,000 rebate or a straight discount of $2,500. It’s unlikely Mazda would further sweeten its deals on the ’17 version of the 6, even during model-year closeout season. Not for 2018, although a new color choice or two is a distinct possibility. The 6 still looks fresh, its 2016 update an evolutionary but effective sharpening of the look that came on line for 2014. The styling is part of Mazda’s Kodo, or “Soul of Motion,” design language deployed across its model line. Expect visual differences between the models to again include the design of the alloy wheels, with Sport retaining 17-inch rims and the Touring and Grand Touring again using 19s, with the latter distinguished by a dark silver finish. Optional on the Touring and standard again on ‘18 Grand Touring should be LED headlights and running lights, though LED fog lamps and an LED grille-surround are likely to remain exclusive to the Grand Touring. Attractive, confident design will again extend to the interior, as well. The gauges are clear and easy to read, the infotainment system well-integrated and governed by the automaker’s intuitive center-console knob and accompanying buttons – an upscale touch for this class. Mazda addressed the 6’s somewhat noisy cabin with additional sound-deadening material for 2017. It retained front bucket seats that hug you in all the right places, though larger folks may find the prominent side bolsters confining. Rear-seat room is good overall; its only significant flaw is a bottom cushion that can be a bit short on thigh support for those who are long of leg. Cargo volume is slightly below the class average. We appreciate Mazda covering the trunk lid hinges to prevent them from crushing cargo, but the apparatus steals some space. Extremely unlikely. All 2018 6 models should reprise a single engine: a 2.5-liter four-cylinder with 184 horsepower and 185 pound-feet of torque. That’s relatively old-school these days, with the trend in the class toward turbocharged four-cylinder engines, typically of 2.0-liters and with more than 185 pound-feet of torque. Also setting the 6 apart: it’s the rare midsize sedan that offers a manual transmission. The slick-shifting six-speed is standard on the Sport and Touring. Optional on those models and standard on the Grand Touring is a six-speed automatic. Despite the competition moving to eight-speed automatics and continuously variable transmissions, the 6’s comparatively old-tech automatic still works extremely well. Still, acceleration is perfectly adequate, if not quiet in line with the 6’s sporty looks or an asset equal to its road manners. The 6 was already one of the best-handling midsize sedans on the road, and 2017’s addition of G-Vectoring Control made it even sharper. Steering feel is precise, body lean in fast turns is almost non-existent, and the 19-inch tires on the Touring and Grand Touring furnish outstanding dry-road grip. The car stumbles a bit on wet and snowy roads, so it may be worth investing in a set of winter tires if you live in such a climate. The 6’s outstanding handling cries for a more powerful engine, but you’ll have to wait until its upcoming redesign in order to take advantage. Don’t count on it. Despite only middling power and a comparatively “old” six-speed transmission, the 2017 Mazda 6 still manages to achieve some of the best fuel-economy ratings among non-hybrid midsize sedans. EPA ratings for the 2018 Mazda 6 were not available in time for this report but should be identical to the ’17’s. They were 24/34/28 mpg city/highway/combined with manual transmission and 26/35/29 with the automatic. The Grand Touring should again be optionally available with Mazda’s i-ELOOP regenerative engine braking system, which converts the vehicle’s kinetic energy into electricity and stores it in capacitors for use in powering the headlights, climate-control and audio systems, and other components. This should again boost the EPA ratings of Grand Touring models equipped i-EOOP to 27/35/30 mpg city/highway/combined. All 2018 Mazda 6 models would continue use regular-grade 87-octane fuel. Almost certainly not. All models have a reasonable level of standard equipment for their respective starting prices. Sport versions have a rearview camera, pushbutton engine start, Bluetooth connectivity, and the Mazda Connect infotainment system with 7-inch touchscreen display and auxiliary control knob located on the center console. Moving up to the Touring nets 19-inch wheels (up from the Sport’s 17s), power driver seat, dual-zone automatic climate control, leatherette upholstery, blind-spot alert with rear cross-traffic detection, rain-sensing windshield wipers, and Mazda’s Smart City Brake Support, which can automatically stop the car to avoid rear ending the vehicle ahead. The range-topping Grand Touring includes a power sunroof, steering-linked LED headlights, and LED illumination for the fog lights, daytime running lights, and front grille, leather upholstery, heated front seats, driver-seat memory, Bose-brand audio system, a head-up display for key vehicle and navigation information, lane-departure warning, and automatic steering to keep you in your lane. Note that models equipped with the full suite of driver-assistance features receive the coveted Top Safety Pick+ award from the influential Insurance Institute for Highway Safety. Surprise: expect them to shift very little. Mazda is pretty good about not increasing prices on vehicles with few or no year-over-year changes. In fact, it’s been known to lower the price of key options or packages. As a baseline, we’ll list base prices for the 2017 Mazda 6, including the automaker’s $875 destination fee. With manual transmission, the ’17 Sport started at $22,820 and the Touring at $25,070. Expect to again add $1,050 if you want automatic transmission. Certain paint colors added $200-$300 for any model. Don’t look for the Sport or the manual-transmission Touring to have any major standalone or packaged options. Ordering an automatic-transmission Touring, however, should again open access to the self-explanatory Bose/Moonroof/Satellite Radio Package (about $1,325). You’ll probably need to get this to qualify for the Touring Premium Package (about $1,425), which adds the Grand Touring’s adaptive LED lighting, heated side mirrors, and heated front seats. The ’17 Grand Touring started at $31,570, which is a bit on the high side for a car that’s not available with a more powerful engine. Its lone option package was the $2,500 Grand Touring Premium Package, which added the aforementioned i-ELOOP regenerative braking system, active grille shutters that can improve the vehicle’s aerodynamics, heated outboard rear seats and steering wheel, and upgraded Nappa-brand leather upholstery. At a projected $26,000 or so, depending on transmission selection, a Touring with no options is probably the best 2018 Mazda 6 value for your money. The 2018 Mazda 6 will probably go on sale by summer 2017. It may be a short production run, as the redesigned 2019 model could be unveiled at the Los Angeles Auto Show in November 2018, with sales beginning in the first quarter of ‘18. A slightly wider cabin and re-shaped rear-seat cushion would improve comfort. That’s a relatively minor nitpick. What we really want to see is a turbocharged and/or diesel engine option for this car. This would allow the 6 to better compete at the high end of the competitive set with the likes of the Ford Fusion Titanium, Kia Optima SXL, and Toyota Camry V-6. We expect all of these deficiencies to be addressed with the Mazda’s upcoming redesign.